IN THE seconds leading up to the teams taking the pitch at the Aviva Stadium this evening, the television audience will be treated to the obligatory live feed from the mouth of the tunnel. The camera placed there will catch Scotland and Republic of Ireland players smiling nervously as they break from their line-ups to press the flesh and politely offer best wishes. Front and centre of shot will be Scott Brown, expressionless and eyes fixed towards some indeterminate point in the distance as he produces The Stare. Bonhomie has to be bagged when about to go into battle for Broonie. It isn’t an attempt to grandstand that the Scotland captain puts on such a game-face, but rather a manifestation of the, at times almost crazed, commitment that has forever characterised his football. Just don’t ask him what is going through his head as he waits to enter the arena. “Do you really want to know what’s going through my head? I don’t know,” he laughed when asked yesterday about the pre-match ritual that will be witnessed by the armchair viewers for the pivotal Euro 2016 qualifier. “I’m just concentrating on the game. I always try to get focused early on. If I can get in the zone, I can concentrate more. I can block out the fans and the other players and concentrate on playing football. Brown the battler isn’t Brown the bawler when it comes to rallying team-mates, which many armband wearers seem to believe goes with the territory. If introspection is your thing to get in the right place mentally for taking the field, then that doesn’t leave room for, what can sometimes seem naff rabble rousing. Brown might like to give the impression of being a devil-may-care-sort, but patently there is a depth to how he treats his professional duties. 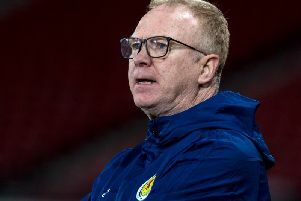 He might indulge in some frippery about the music that is played in the Scotland dressing room – Darren Fletcher’s seems to meet general approval, with Brown “quite chilled” in these moments – but he knows what should be highest on the agenda as a team prepares for any international. Brown and the rest of the Scotland squad don’t like to talk about the potential ramifications of tonight’s result for the final standings in Group D. A Scotland victory would leave the Republic five points adrift of Gordon Strachan’s side and toiling in fourth place. Were Brown to help his team to a win in Dublin the result could, allowing for a number of favourable outcomes in other sections, leave Scotland within one victory of heading to next summer’s European Championship finals in France. “We will just take it as it comes. It is going to be a hard game for us. I think at the end of the day it is not exactly do-or-die with both teams just now but it would be nice to get the points on the board.” Brown, by his actions, is becoming adept at getting his points across.